With the rise of IS, it is of interest to examine how IS has secured pledges of allegiance (bay'ah) from other groups both on the domestic front (i.e. within Iraq and Syria) and abroad (e.g. in Gaza-Sinai and Libya). I would argue that the case of Jamaat Ansar al-Islam ('The Group of the Supporters/Partisans of Islam') offers instructive insight not only into the factors that lead to pledges of allegiance but also the means of interpreting the available evidence. To recall, Jamaat Ansar al-Islam is the latest incarnation of the al-Qa'ida-linked Ansar al-Islam of Iraqi Kurdistan that was destroyed in the aftermath of the U.S.-led invasion of Iraq in 2003. Remnants then formed Ansar al-Sunna, which split two ways in 2007: Jamaat Ansar al-Islam and Jamaat Ansar al-Sunna, the latter of which has recently claimed some very limited operational activity in the south of Baghdad and issued a lengthy tract from its leader calling for unity among the 'mujahideen of the Ummah.' The main areas of Jamaat Ansar al-Islam's presence in Iraq have been Mosul, Kirkuk province, and over the course of this year the Tikrit area and a more limited emergence in Anbar province. In 2011, one of the leaders of Jamaat Ansar al-Islam- Abu Muhammad al-Muhajir-** expanded the group's presence into Syria, setting up a camp in al-Hewel in Hasakah province on the border with Iraq. Calling itself 'Ansar al-Sham,' Jamaat Ansar al-Islam then spread its presence across northern Syria. Though aspiring for the goal of a global Caliphate, Jamaat Ansar al-Islam has traditionally been a rival of IS and its prior incarnations- the Islamic State in Iraq and ash-Sham (ISIS) and the Islamic State of Iraq- because it has not accepted the claim that IS or its predecessors constitute an actual state, let alone a Caliphate. This sparked multiple clashes in Mosul and Kirkuk province, with the targeting of Jamaat Ansar al-Islam-linked professionals and religious figures in the former in particular. In early 2013, Jamaat Ansar al-Islam had appealed to al-Qa'ida leader Aymenn al-Zawahiri to restrain what was then the Islamic State of Iraq, but to no avail. "Indeed we give good news to the Islamic Ummah in the east and west of the land of the announcement of the dissolution of the group [jamaat] 'Ansar al-Islam in Iraq' and allegiance to the Commander of the Believers: Caliph Ibrahim (may God protect him)…This pledge of allegiance has come after sessions and meetings with the sheikhs of the Islamic State who showed to us the legitimacy of the Islamic State's project via proof in tradition and thought. The last of these meetings was on 29 Shuwwal, in which we announced the bay'ah by group and individual membership, and before that, proof had been shown to us regarding the truth of the existence of the Islamic State on the ground as a state with establishments having weight in this environment of states. It is also the one [state] that has defeated the Crusaders, broken the thorn of the Safavids, annihilated the apostate Sahwa forces, bloodied the nose of the secularist Kurds, opened up the abode of the Muslims, got rid of the artificially imposed borders among the land of the Muslims. It is also the one that has broken the bonds and freed the lions, and it is the one that has made God's law the ruling authority, has implemented the hudud [Shari'a punishments], established offices and has been just towards the oppressed. Moreover, it has established security, cultivated order and protection, and provided support for the orphans and wayfarers. All that and more we have seen with our eyes and felt with our hands, so may God reward them best in the stead of the Muslims. This statement's veracity was immediately denied in a statement put out on what was then Jamaat Ansar al-Islam's official Twitter feed, which I have translated here. At first sight, one might be inclined to go with my initial assessment, based on the issuing of the denial on the official Twitter feed, that Jamaat Ansar al-Islam in Iraq had not been really been dissolved after all, even if it had been significantly weakened by the allegiance pledges to IS (without quantifying exactly how far it had been weakened). However, it is now apparent that the statement above put out in the name of Jamaat Ansar al-Islam's Majlis Shura, far from being a mere forgery, represented the overwhelming majority of the organization, and that whoever controlled the group's official Twitter feed at the time only constituted a small remnant that had not pledged allegiance to IS and has subsequently ceased to exist for all intents and purposes as a distinct Jamaat Ansar al-Islam in Iraq on the ground. Multiple lines of evidence corroborate this assessment. First, since the issuing of the denial of dissolution, the group's Twitter account has disappeared and has not re-emerged. It is normal for jihadi groups to set up mirror accounts, unless Twitter is taking steps to ensure that all subsequent accounts are deleted promptly, which is what forced IS off Twitter in an official capacity. Second, there have been no new media releases of any sort: no new photos, videos or statements. For example, Jamaat Ansar al-Islam in Iraq is supposed to release something every year in relation to Eid al-Adha (e.g. here in 2013,here in 2012, here in 2011, and here in 2010), but nothing this time around, even as Jamaat Ansar al-Islam in Bilad al-Sham [Syria] put out photos in relation to the occasion. 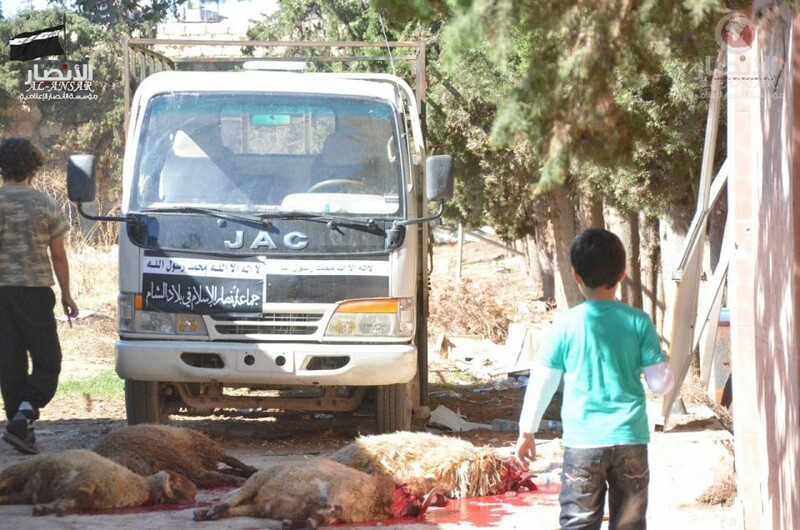 Jamaat Ansar al-Islam in Bilad al-Sham: slaughter and distribution of meat for Eid al-Adha 2014. Finally, we come to testimony I myself have gathered, this coming from one 'Abu Bakr al-Iraqi', one of those from Jamaat Ansar al-Islam in Iraq who has not pledged allegiance to IS. When I asked him about the lack of any new media releases from Jamaat Ansar al-Islam, he explained that "the group came to an end 3 months ago as around 3000 of them pledged allegiance to the Dawla, which constitutes a ratio of 90%." Despite his own lack of pledge of allegiance, Abu Bakr al-Iraqi is sympathetic to/understanding of those from Jamaat Ansar al-Islam who defected to IS, tweeting recently: "Whoever attacks our brothers the soldiers of Ansar al-Islam who pledged allegiance to the Dawla, I say to them: 'Be aware of God, for they have not abandoned their arms. Whereas we have remained seated, they are in their place. This is better than [what] we [are doing.]'" It will also be recalled that Abu Bakr al-Iraqi, despite his misgivings about IS' conduct in brutally crushing the Shaitat tribal rebellion in Deir az-Zor province, had nonetheless expressed approval of the beheading of James Foley, and characterized the coalition against IS as part of a war on Islam (a discourse that goes beyond Iraq's jihadi groups: cf. the Islamist nationalist 1920s Revolution Brigades in a recent statement). In sum, what we have here is a case of pledges of allegiance arising not only on account of IS' assertions of wealth and power but also strongly facilitated by ideological overlap. After all, if one is aspiring for a Caliphate, then there is certainly some allure in pledging allegiance to a group that already claims to be a Caliphate and has the real trappings of a state entity, unlike IS' predecessor the Islamic State of Iraq. In this process of rapid pledges of allegiance, IS has effectively destroyed Jamaat Ansar al-Islam's project to spread through Syria and Iraq as one battlefield, as the group's Syrian branch is now isolated in Aleppo and Idlib, having been cut off from Iraq on account of IS' control of Raqqa province as well as most of Deir az-Zor province and all parts of Hasakah province not controlled by Kurds or the regime. I also mentioned in the beginning of this article that the case of Jamaat Ansar al-Islam offers insight into how we interpret available evidence. Just because a statement put out in a group's name is not issued via that group's official media channel, it should not automatically follow that this statement is a mere pro-IS forgery of no meaning or value. On the contrary, as my friend and colleague Daveed Gartenstein-Ross has commented in relation to IS and securing pledges of allegiance outside of Syria and Iraq, one aspect of IS' strategy appears to be to have those ready to declare their allegiance within a particular group to issue a statement in that group's name regardless of any disapproval at the official level. What then follows of course depends on circumstances by case. To illustrate this point, one can look at Egypt's Jamaat Ansar Bayt al-Maqdis (JABM) for comparison. As happened with Jamaat Ansar al-Islam in Iraq, a statement was put out in JABM's name claiming a bay'ah to IS, which was then circulated in the Egyptian press and in a Reuters story. The statement was then denied on JABM's Twitter feed the next day, but then days later an audio was released on that same Twitter feed affirming bay'ah to IS. Though not exactly analogous, it would seem that in both cases the initial event of a statement in the group's name claiming allegiance was probably the result of IS encouraging those willing to pledge allegiance- at that point the majorities in their groups- to put out a statement, which would force loyalists unwilling to lose their groups' distinct identities to respond in some way. With JABM, the difference (as opposed to Jamaat Ansar al-Islam's traditional rivalry with IS) would appear to be that most of the reluctant remnant controlling the official media channel was trying to have it both ways in being sympathetic to IS without actually pledging allegiance, which might explain the rather odd tweet denying the initial pledge of allegiance while referring to IS leader Abu Bakr al-Baghdadi as the 'Caliph of the Muslims.' Thus, this remnant was compelled to issue a pledge of allegiance days later to preserve credibility, while any others still unwilling to pledge (as allegedly existed in the Nile Valley area) would disband and perhaps join other groups (e.g. Ajnad Misr?). Admittedly, the above as regards JABM is somewhat speculative, but that such experiments in thought seem necessary should point us to the most salient lesson that jihadi groups are never monolithic in alignments and approach, whatever apparent uniformity might be conveyed by official statements. ** (Note: 29 November): To be clear, in conjunction with another leading figure in Jamaat Ansar al-Islam, as the link to the life of Abu Muhammad al-Muhajir makes clear.